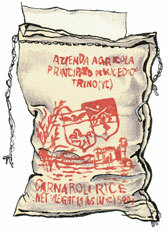 Carnaroli Rice for sale. Buy online at Zingerman's Mail Order. Gourmet Gifts. Food Gifts. The best Italian rice for risotto. In the north of Italy they eat as much risotto as they do pasta. Great risotto starts with great rice. To my mind, there's none finer than Carnaroli. Carnaroli rice draws rave reviews from Italian experts. Almost every well-known food person I've talked to in Italy tells me that they cook their risotto with Carnaroli. Developed in northern Italy in the 1940s, Carnaroli is difficult to grow and has small yields; also, its stalks tend to get overly heavy, and at times the plant is unable to hold the weight and collapses. Because of all these drawbacks, Carnaroli accounts for just over one percent of Italian rice production. But the benefits are in the flavor. It absorbs more broth (and hence more flavor) than any other variety while still keeping its structure intact. It makes the creamiest, best tasting risotto I've ever had. For anyone who likes risotto—or wants to try to make the dish—it's a great rice to rely on.